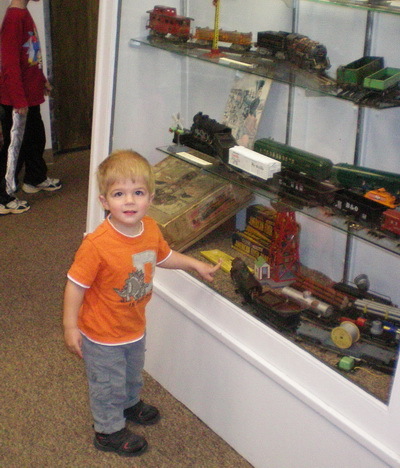 The Children's Hall is a great place for little ones to "play trains"
JOIN US FOR "STORY TIME"
Designed for young visitors, we have fun listening to a couple of stories, having an activity, and enjoying the trains in the Children's Hall. First & third Mondays each month, 10:30 a.m. SPECIAL PRICE only $5 per family to cover cost of activity materials & snacks. Our youngest visitors love the Children's Hall, where imaginations have free rein on the play tables in lively surroundings. 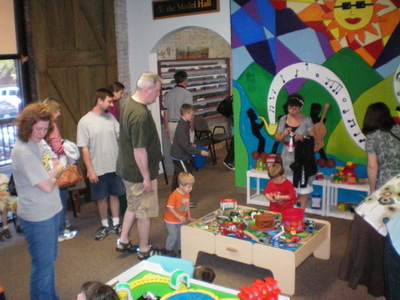 A large-scale layout backs up the play area, providing lots of actions and operating accessories. Children's films run continuously while kids get to build their own railroad empires. Push-button operation on the layouts lets kids start up the trains for their own imaginary travels. The miniature caboose provides a space for pillow play, as well as a place for photos.